SEATTLE (April 25, 2018) – Following two days of training in Seattle featuring 19 members of the 2018-20 USA Basketball Women’s National Team athlete pool, the roster has been pared to 13 athletes for the USA’s April 26 exhibition game against China at KeyArena. 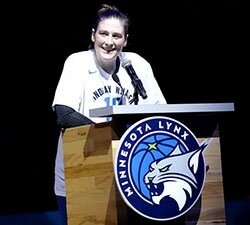 The team for the friendly contest versus China was chosen by the USA Basketball Women’s National Team Selection Committee. 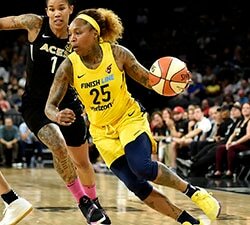 Tickets for the game, which will tip-off at 7 p.m. PDT (10 p.m. EDT), are available via StormBasketball.com or by calling the Storm at 206-217-9622. The game will be streamed live online at usab.com/live, and on the USA Basketball Facebook and YouTube channels. 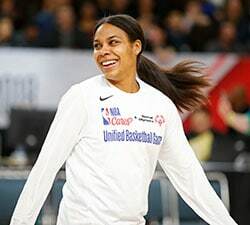 Set to compete in the USA’s exhibition game against China are: Seimone Augustus (Minnesota Lynx); Sue Bird (Seattle Storm); Layshia Clarendon (Atlanta Dream); Elena Delle Donne (Washington Mystics); Skylar Diggins-Smith (Dallas Wings); Stefanie Dolson (Chicago Sky); Sylvia Fowles (Minnesota Lynx); Tiffany Hayes (Atlanta Dream); Jewell Loyd (Seattle Storm); Kelsey Mitchell (Indiana Fever); Breanna Stewart (Seattle Storm); Diana Taurasi (Phoenix Mercury); and Elizabeth Williams (Atlanta Dream). “These are hard decisions to be made, when you have to send such good players home,” said Dawn Staley, USA National Team and University of South Carolina head coach. “But, their sacrifice will one day pay off, hopefully in the near future for them. The 13 players that were assembled to compete against China will give us an opportunity to see some of our experienced players back together again, along with some of the younger, inexperienced players. It’ll give them some experience playing international basketball at a high level alongside Olympians. You can’t take for granted playing China. We’re going to play to win the basketball game, but we’re also going to utilize some players so we can see them play in a game like this. 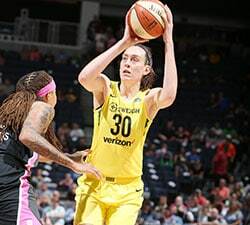 Listed among the exhibition game roster are six Olympic and FIBA World Cup gold medalists, including Bird, who tops the list with four Olympic gold medals, three World Cup golds and one World Cup bronze medal. Taurasi also owns four Olympic golds and has two World Cup gold medals and one World Cup bronze. Augustus and Fowles won three Olympic golds apiece, both have one World Cup gold medal and Augustus also has a World Cup bronze medal. Stewart won gold at the 2014 World Cup and 2016 Olympics, and Delle Donne earned Olympic gold in 2016.